Today's post is one of the most popular Indian snacks recipe, Cashew pakoda or Munthiri pakoda. This is very quick to prepare in a healthier way at home and tastes crispy crunchy divine along with evening tea / coffee. Or it makes an ideal party starters / appetizer recipe. This hot and savory snack is prepared with cashew, besan flour along with spices. 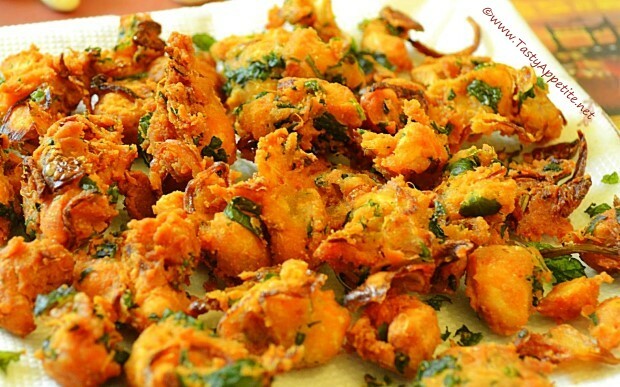 The curry leaves added gives a unique flavor and delicious taste while munching the pakoda. I will show you how to make crispy cashew nut pakoda with this easy video recipe! Add cashewnuts to mixing bowl. Add besan flour, rice flour, salt, hing, red chilli pwd and mix. Add sliced onions, green chilli, curry & coriander leaves. Add 1 tsp of ghee and give a good mix. Now sprinkle little water just enough to bind the ingredients and to get a sticky dough consistency. Take the cashew dough and drop it in batches in hot oil. Deep fry on both sides until the pakodas turn golden in crispy. Keep the flame in medium and fry. Once the cashew pakodas are done, drain from oil in kitchen tissue. Lipsmacking crispy delicious cashew nut pakodas are ready. Enjoy hot with any dip of your choice along with evening coffee or tea.